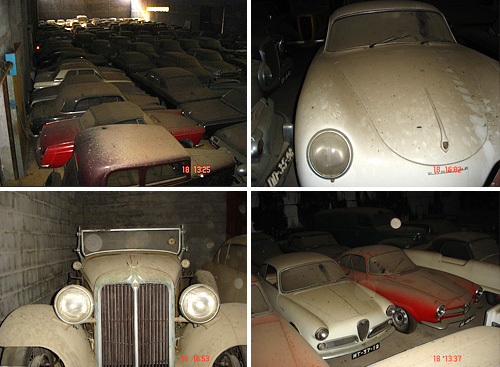 Man Buys Farm – Finds Barn Full Of Vintage Cars | OhGizmo! As the story goes someone in Portugal bought a farm on a plot of land that had been abandoned for 15 years or so. While exploring their property they found a large barn that was locked up tight with a rusty padlock. After a bit of brute force they got the lock off and opened the doors revealing a mind-blowing collection of vintage cars. I could list all the vehicles they’ve managed to identify so far but I know the effect is a lot better if you scroll through the collection of photos yourself. And while most of the vehicles are understandably pretty dusty a good number of them appear to be in great condition. I’d gladly spend a year or so fixing up that Porsche 356 in particular. That must of been a fantastic surprise. I really hope the new owner is a bit of a petrol head. Wow! What an incredible find! The previous owner was obviously a passionate used vintage cars collector. Thanks for posting that article! That must of been a fantastic surprise. The previous owner was obviously a passionate used vintage cars collector.